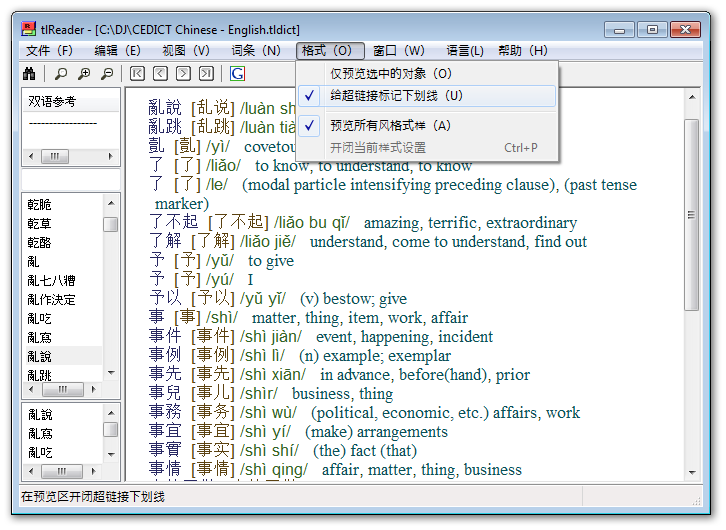 tlReader (previously TshwaneReader) is a free reader application that can be used to view TLex and tlTerm dictionary and terminology database files, and tlDatabase files. If you already have the TLex Suite installed, you do not need to install tlReader separately. tlTerm and TLex are currently in use by many individuals and organisations worldwide, including Oxford University Press, Macmillan, Van Dale Lexicografie, Pearson, Longman, the South African National Lexicography Units, the Department of Arts and Culture, the Spanish Royal National Academy of Medicine, Grupo Clarín in Argentina, the South African Police Service, the Department of Arts and Culture (South Africa), the Welsh Language Board, and the Malaysian Institute of Language and Literature. We also offer support, training, consulting and custom development services for all aspects of the lexicography or terminology management process - both technical and linguistic - as well as data importers for loading existing data, or publishing of terminology databases and dictionaries electronically or online. Contact us for more information.